There is a wide variety of options to choose from when trying to select the best organic aphid spray. If you're looking for spray for your home garden you may be able to make the spray yourself from common ingredients, but professional farmers will need something a little more substantial. What is an aphid? Aphids are small insects that feed off the juices of plants. Aphids can cause a great deal of damage to the plants, especially if the aphids are present in large numbers. These bugs can cause problems for occasional gardeners as well as large-scale farming operations. The term aphid refers to a category of insect and encompasses thousands of species of bugs. If an insect falls within the characteristics of this kind of bug, it can be considered an aphid. 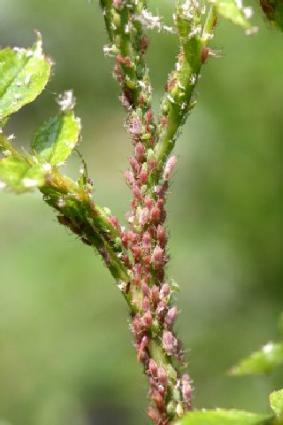 In conventional farming and gardening, aphids are usually dealt with using a pesticide. The spray kills the aphids, but may also penetrate the plant and pass the toxic chemicals on to whatever eats the plant. Livestock consumes plants - but so do people, of course - so this can be a potentially dangerous situation. Pesticides can also potentially reach water sources, making the water dangerous to drink. Organic gardening and farming calls for methods other than pesticides and other chemical solutions in order to control the aphid population. A gardener or farmer wanting to produce stock that is considered organic should not use conventional aphid sprays because they can contain many potentially harmful ingredients including permethrin and bifrenthrin. Gardeners and farmers should keep in mind that conventional pesticides are designed to kill aphids, and therefore must contain destructive and harmful ingredients. There is no guarantee that these ingredients will not permeate into the plants, or perhaps even affect the person applying the spray to the plants. Aphids certainly cannot be ignored because they can be quite destructive to plants. On the other hand, aphids can also be a valuable member of the balance in the garden or farm. Without aphids present, ants may need to seek out alternate means by which to feed, and this can potentially throw the balance off considerably. Organic aphid spray is not nearly as toxic as conventional pesticides, and therefore it may be easier to apply in the amounts desired without harming other organisms. Organic spray can also avoid the problem of tainting the plants with harmful chemicals, making them healthier for consumption. Organic aphid spray can be made using common ingredients or can be purchased from a manufacturer. Gardeners and farmers purchasing aphid spray should take care to ensure the spray is suitable for organic crops before using the spray. All it takes is one spray of toxic chemicals to transform a crop from organic to a regular crop, and since the asking price for organic crops is generally higher, it's important to keep all methods organic. Gardeners can make their own aphid spray at home while keeping their methods organic. One popular method is to boil orange peels in water for several minutes and then spray plants with the resulting liquid. Be sure to use oranges that are certified organic.Other popular homemade sprays utilize ingredients such as garlic, tomato leaves, and a variety of other ingredients for use as aphid spray. You may need to experiment to find out which method works most effectively for the species of aphid you need to get rid of. You may be able to find organic aphid spray at a local store. You can also purchase this type of spray online. Remember that organic gardens and farms inevitably must accept a higher ratio of bugs in most instances due to the lack of pesticides. Also keep in mind that not all bugs are detrimental to your crop. You should pay attention to how the bugs affect the crop before resorting to annihilation methods.